Guest post by Mike Corak, Vice President of Strategy at digital consultancy Tallwave, and blogger at Digital Marketing Strategy. About a year ago, I wrote a guest post here titled “Use Online Listening for Competitive Research. The post explored the topic of utilizing common interactive marketing tools in unintended ways to tap into consumer demand. Not unlike traditional surveys, keyword research and social data mining tools tell a powerful story about the information target audiences want from organizations, on-and-offline. In the time that’s passed since that post, my colleagues and I have tested and refined the concept and methodology with our clients. In doing so, we’ve learned that findings resulting from search and social data mining are incredibly handy for informing creative and content, improving relevance and impact. In today’s post, it’s my pleasure to share some content relevance tips I’ve learned along the way. Until recently, interactive marketing tactics and techniques, bells and whistles, and new online tools often outshone smart, targeted messaging. Now, the rules are changing, and noteworthy, quality content is the future of online marketing success. While alterations to search algorithms are helping to bring this to fruition, social media has been the real game-changer, placing the power of relevance distinction in the hands of the consumers. This allows (mandates, even) the cream to naturally rise to the top. Sure, digital magic tricks still influence results and always will, but they can no longer do so alone, and the only sure-fire way to win is to supply great content to meet demand. Sort the common search phrases by topic, and prioritize them by demand. This helps organize content and plan for creation topically (ex. 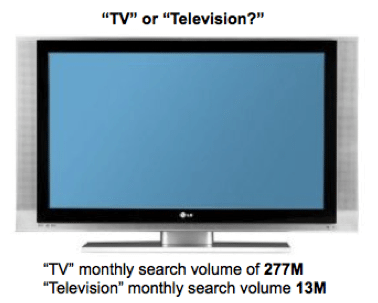 meet the demand for HDTV interest over other types of TV content). Observe what types of content social media users are interacting with and where. This helps inform the type of content that needs to be created, and where it should be distributed outside of the website (ex. 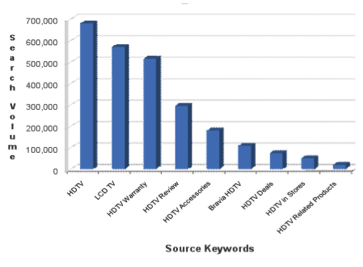 prepare TV review content about HDTVs for twitter and blog comment distribution). Follow traditional content strategy planning steps, informing the effort based on demand and planning for results. This makes for both short and long-term success (ex. audit current content against demand, analyze the quality and type according to needed media, develop a plan to adjust current content and create needed content, and measure the results achieved).